I love argillite. Of all the media used by the First Nations artists of the Pacific Northwest, argillite has by far the most mystique and romance, as well as the greatest visual appeal. Argillite is a black slate found only on Slatechuck Mountain on Haida Gwaii. Similar slates have been in a few other places around the world, but have slightly different chemical compositions that make them less suitable for carving (or so I’ve been told). Only members of the Haida nation are supposed to be allowed on the mountain, and families have unofficial quarries whose exact locations they try to keep secret. Rumors persist of a logging road that makes access to the quarries easier, but, generally, artists either have to carry out the argillite they quarry on their backs down a narrow trail, or else buy what others chose to sell – usually at about five dollars a pound on Haida Gwaii, and as much as twenty dollars a pound in Vancouver. 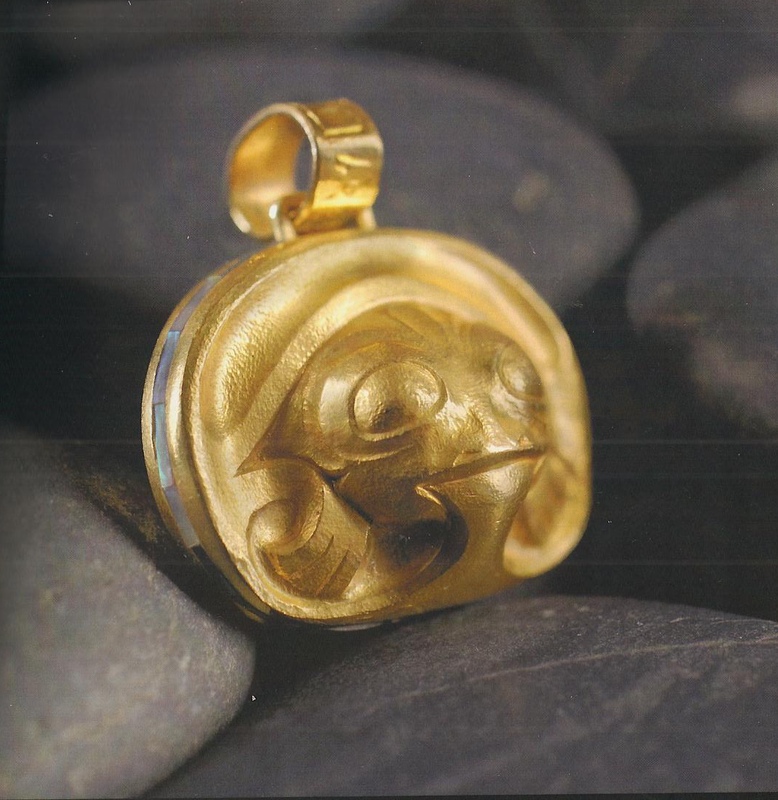 The tradition has been to keep argillite out of the hands of non-Haida, although a black market makes small amounts generally available to other artists, who generally turn it into pendants. The history of argillite carving is equally romantic in its obscurity. The standard account is that argillite carving did not begin until 1820, and that the pipes that were among the first carvings known were never actually used. However, while European tools and interest in curios made the 19th century a Golden Age of argillite carving, it seems unlikely that such a sophisticated art form could emerge suddenly without at least a few centuries of tradition. Studies of early pipes show a residue that prove that some early pipes were definitely used, but, since heat can crack argillite, most likely it was a medium reserved for shamans and other ceremonial use before the nineteenth century. But whatever the truth of the matter, argillite carvings became a major trade good in the 1800s. Unlike other traditional art, these carvings consisted of far more than family crests and the stories that families and title holders held the right to tell. Instead, the carvers of the time also depicted the animals, peoples, and plants of everyday life. Sometimes, they imitated the patterns of the china plates carried by American traders. Other times, they made miniatures of houses and canoes. At times, they depicted the Haida viewpoint of the European traders and immigrants, offering some of the few contemporary depictions of colonization from the perspective of the colonized. Nineteenth century argillite was not completely naturalistic. For instance, a head is generally one-third the length of the body. However, much of it is painstakingly detailed, with muscles on arms and legs or the individual strands of a rope all clearly delineated in a way that the more traditional wood carving almost never is. During its development, argillite carving also developed its own stock poses, such as a shaman holding a rattle in his upraised right hand and a knife in his left. Like other art forms, argillite carving suffered because of epidemics and Christianization. However, because it was a trade good, argillite carving never declined quite as much as more traditional forms. Probably, it helped, too, that Charles Edenshaw, one of the first great Haida carvers whose name and career we know, was a skilled argillite carver – although this aspect of his art was omitted altogether from the recent exhibit of the works of Charles and Isobel Edenshaw at the Museum of Anthropology. Today, argillite is a niche market. 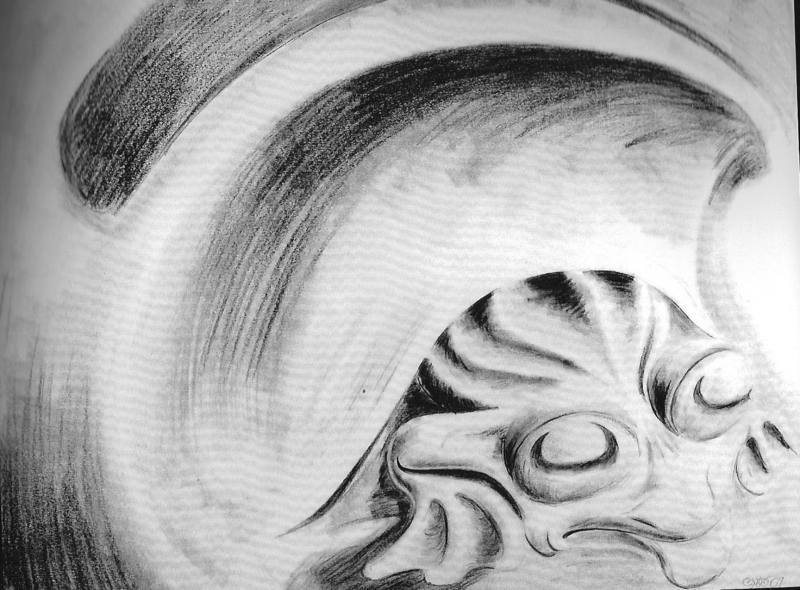 Bill Reid was influenced by argillite design, but only experimented with the actual medium. 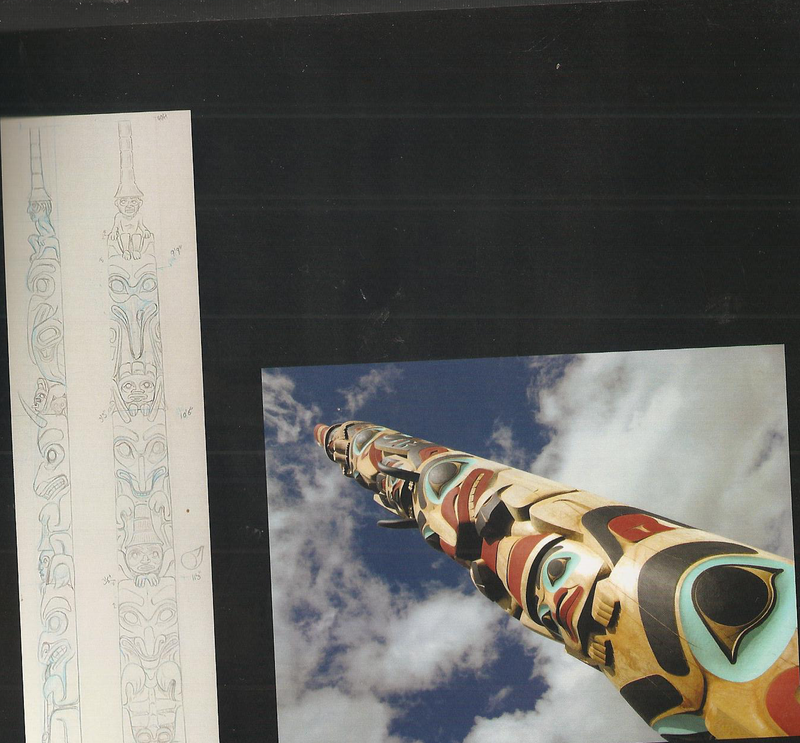 Similarly, while Robert Davidson as a teenager sold model totem poles in argillite for the tourist trade, it has never been his favorite medium. The same is true of artists such as Jay Simeon, Ernest Swanson, Gwaai Edenshaw or Marcel Russ, although all of these artists can produce outstanding argillite pieces when they take the time. The trouble seems to be that argillite is more temperamental than wood, silver, or gold. It is dirty to work with, resistant to tools, and prone to flaws that can destroy hours of work with one misplaced stroke. Because of its water content, it can shatter in the cold. Artists like Christian White or Gary Minaker Russ who have done most of their work in argillite are essentially specialists, appealing to a relatively small and expensive market. Excluding pendants and miniatures, galleries rarely have more than two or three pieces of argillite at any one time, and prices usually begin at about $8000. Nor has the reputation of argillite been helped by the growing practice in the last decade of inlaying pieces with gold, silver, and semi-precious stones. Often, such inlays are added before carving begins, seriously interfering with the artist’s ability to add detail, and, almost always, they are added in lieu of detailed carving. Moreover, because such inlays are expensive, they add substantially to prices, which means that buyers are being asked to pay more for inferior work that increases very little in value. Quality argillite pieces are still being carved, but to find them buyers either have to visit Haida Gwaii or at least deal with artists directly. However, the effort to find quality can be well worth the effort. Even when left with its natural finish, argillite has a reflective finish that makes a carving rich in shadows and highlights. These shadows and highlights change with the available light, but always adds a unique impression of depth and motion. They make argillite a medium that demands to be touched, and its carving traced over and over with the fingers – in fact, many believe that frequent handling prolongs the life of a carving, because the oils from human hands replenish the moisture that was originally in the slate. Elegant and mysterious, quality argillite carvings are an under-appreciated glory of Northwest Coast art that never fail to capture and intrigue the eye. Gwaai Edenshaw was long overdue for a solo exhibit. 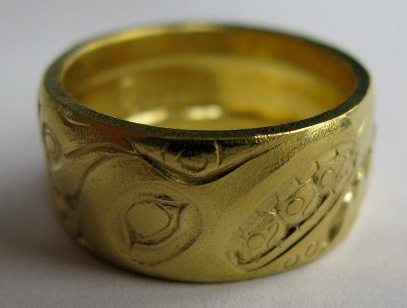 Both a goldsmith and a traditional carver, he is an artist’s artist, and his work is in popular demand. 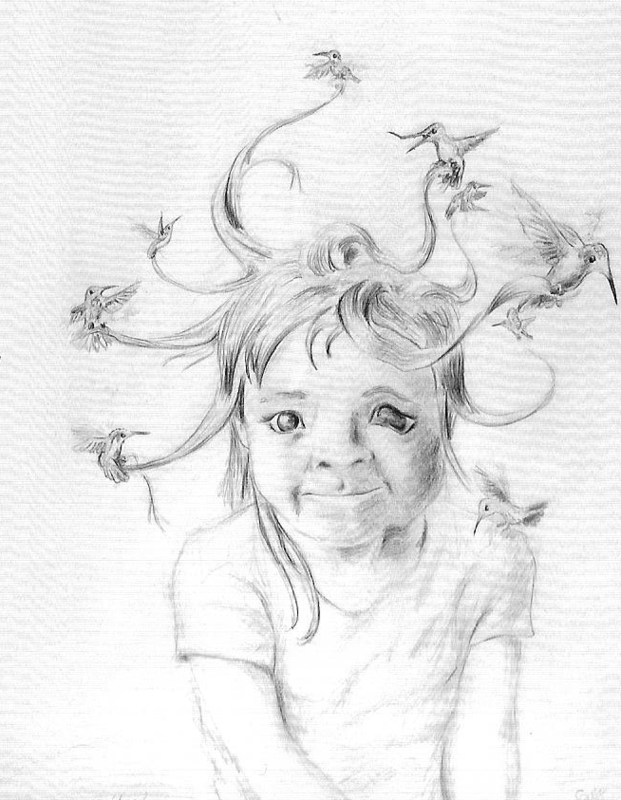 However, for his first exhibit, he has chosen to emphasize another aspect of his work: his graphite and ink drawings, and their role in his artistic process. “Sounds Good on Paper,” currently at the Petley Jones Gallery, does include some his work in gold, but largely to illustrate the importance of his preliminary drawing in his jewellry. With this theme, the show’s catalog inevitably chooses “The Dreamer” as the piece on the cover. The piece is not only an obvious choice for the theme of the artistic process, but for Gwaai himself (to use the name with which he signs his work). The cartoon style is a reminder of his animation prototypes for teaching the Haida language, and the rings on the hat, a sign of high status in traditional culture an indication of the importance of art among the Haida today. At the same time, the doodles around the margin, as rough as they are, have a non-traditional look. 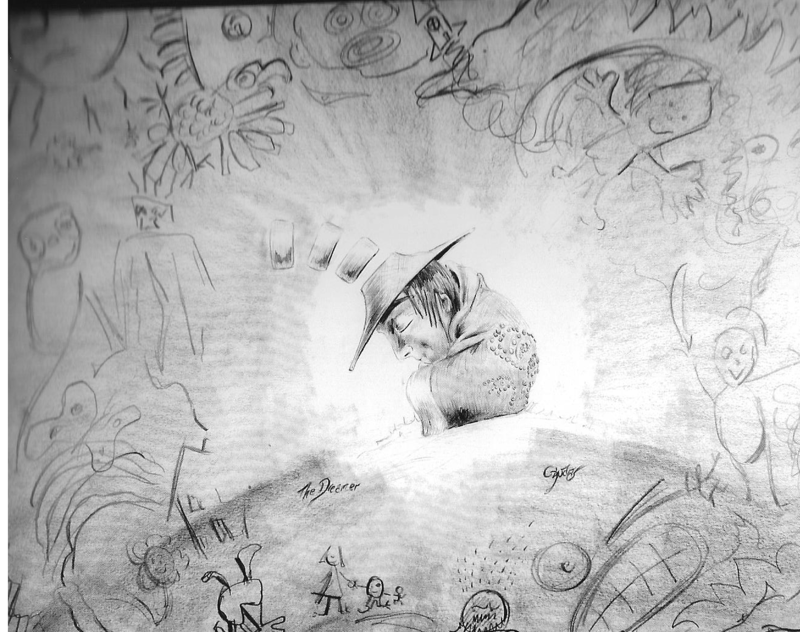 Also, to anyone who has sat down with Gwaai for any length of time, they are a reminder of his constant doodling. This movement between traditional Haida culture and urban industrial life – so effortless that it includes analogies – suggest the position of the modern First Nations artist. For those of us who have met him, it also seems very typical of Gwaai’s wide-ranging mind. Both the sketch and the pendant are powerful works in their own right, but together they illustrate what is gained and lost in the transfer between media, as well as the limitations of each. It is this relationship that makes the oxymoron title of “Sounds Good on Paper” a suitable title for the exhibit. Casual observers might be tempted to to describe “Sounds Good on Paper” as a minor show. And, in one sense, they would be right: most of what is displayed are not the pieces for which Gwaai has rightfully gained his growing reputation. Yet such a view would also be short-sighted. More than anything else, “Sounds Good on Paper” is a very personal show. It displays many different aspects of Gwaai’s personality – probably not all –and offers a tantalizing hint or two of his creative process and his interest in different media. My only regret is that the show couldn’t include some examples of Gwaai’s argillite prototypes for his jewellry. Placed beside the finished jewellry, these prototypes could have provided yet another perspective on the concerns of the show. However, even without this touch, “Sounds Good on Paper” remains interesting both aesthetically and psychologically. It’s been a long time since I’ve seen an exhibit that shows so much of the artist without a hint of arrogance. Asked the day after the opening what I thought of the exhibit, my first response was, “It’s very Gwaai.” Having had a few more days to think, I still that response the most accurate I could have given. The stories of Raven stealing the light or Raven prying open a shell that contains the first people continue to inspire great art, and have the advantage of being no single family’s property. But they are only a fraction of the stories and themes that could be told in Northwest Coast art. That is why, when I buy art, I am always interested in less often heard subjects – the change is interesting to me, and, I hope, a change of pace for the artists as well. 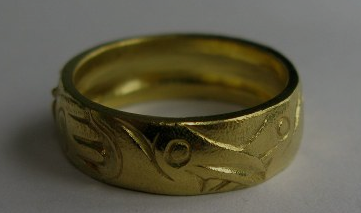 A case in point: “Healing Ring,” the second of the rings made for us by up and coming artist Gwaai Edenshaw (the other ring was “Raven and Crows,” which I blogged about earlier). [The] centre of the ring is Fungus Man, made famous in the story of Raven and the First People. The only [one] of Raven’s helpers that was strong enough to face the feminine energy/sprit, and bring it to humanity. This character was likely Fomitopsis Officinalis. This is a shelf fungus that is analogous to a Chinese medicine (in fact one of Chinese Medicine’s most prized medicines). It was almost definitely used by Haida shamans. 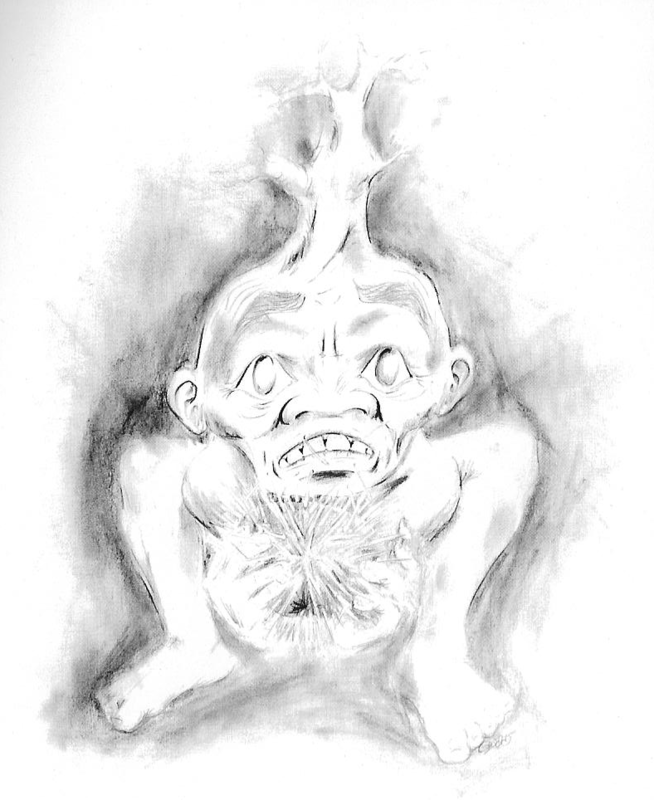 Samples of it have been found among shaman’s effects (this was thought to be wooden carvings until a recent test of the wood revealed it to be Fornitopsis. Fungus Man appears out of a bush of K’waay K’ia (Indian Hellebore), a very important medicine to us. Like many medicines it has potential for toxicity, but in the hands of the right practitioner it is a true marvel. Also called Laricifomes officinalis, the fungus is almost extinct in Europe, but is found in old growth forests in the Pacific Northwest. In various locales, it has been used to treat tuberculosis, pneumonia, asthma, rheumatoid arthritis, infection, and smallpox, and to ensure long life. 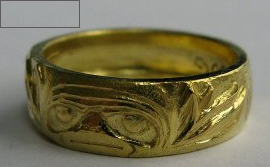 I believe that the appearance of the fungus on the ring is one of the first instances in which Edenshaw has combined his interests in Haida botany and art. In fact, aside from what appears to be tobacco leaves and European-influenced floral designs in some argillite work, flora of any sort is rare in Haida art, although some mainland nations have floral crests, such as the Gitksan Fireweed clan. On the reverse side is a pair of herons. These are the helper in a number of stories, notably the Gunarsiargit story where they play a small but critical role in the story’s namesake fulfilling his destiny. More specifically, a heron often dwells on the edge of the village, some distance away from the inhabited houses. This locale reflects the heron’s often lone habits, but might also suggest a shaman, since shamans often lived and certainly were buried separately from everyone else. For me, these are the kind of details that, when combined with artistic skill, can make Northwest Coast art so satisfying to me. They offer not only aesthetic pleasure, but, for a European ethnic like me a small window into the cultures that produce them. And Edenshaw, besides being a gold smith with a genuine feel for the metal, is also clearly someone deeply knowledgable about his culture as well. One way that you know an artist is talented is when other artists are eager for their work. Gwaai Edenshaw is in that enviable position among the Northwest Coast artists who live in Vancouver. A some-time botanist and Bill Reid’s last apprentice, he works largely in gold, although he has been known to sketch, carve wood, and even experiment with animation. Having admired his work since we first saw it, Trish and I recently celebrated our anniversary by buying two of his rings. 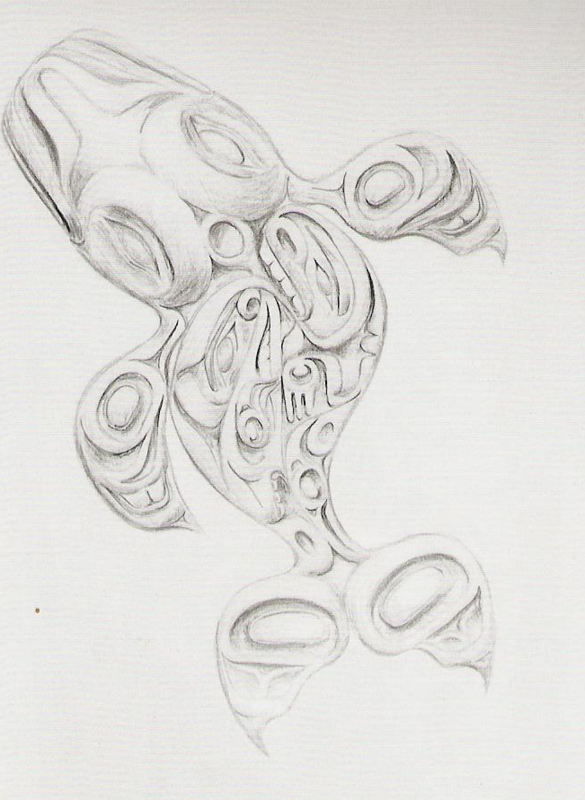 Mine is based on an episode in “Raven Traveling,” the Haida narrative of the Trickster’s wanderings near the beginning of time. On the beach, the raven encounters a group of crows. They begin to cook a salmon. The raven falls asleep, but the crows can’t wait for him to wake, and devour the salmon. Belatedly, they realize that the raven will be angry when he rouses, so they take the remaining crumbs of salmon, and wedge them between his teeth. When the raven wakes, hungry for his meal, they point out the crumbs and ask, “Don’t you remember? You ate it before you went to sleep.” Angry at the deception, Raven throws the crows into the fire, turning them forever from white to black. I appreciate the story for its broad humor, as well as its extrapolation from nature; crows really do mob ravens, especially when their young are in the nest. If crows could play practical jokes on ravens, they undoubtedly would. Also, the story is not one of the ones that is generally depicted, like raven’s stealing of the light, or even his theft of the salmon from the beavers. I suggested the subject to Edenshaw, and waited with all the patience that anticipation would allow for six months until he had time to get to it. The result was more than worth the wait. Edenshaw chose a style that fits the humor of the story, showing the raven with his beak open and crows rollicking around him, pushing the crumbs of salmon into his mouth and their beaks open in excitement, no doubt chortling with glee at the thought of putting one over on their rival. Since the raven has teeth in the story, and the Haida storytellers must have had plenty of chances to notice that birds have none, I assume that he must have been in human form when he met the crows. However, the fact that Edenshaw chose to show the raven as a bird with teeth in his beak does not detract, any more than the teeth in the beak of the parrot in Aladdin. It is a comic touch, and the result is reminiscent of the lively cartoons that you see in the margins of medieval manuscripts. I especially like the mischievous crow that is pushing a piece of salmon along the raven’s back (You can see the crow’s beak just behind the top of the raven’s head). At the same time, I appreciate the economy and skill with which Edenshaw rendered the story. Like a business card (only more so), a ring provides a very limited space for depicting anything, yet Edenshaw manages to focus on the main event of the story, while selectively choosing details so that, while the feathers on raven’s head are not visible, the pieces of salmon clearly are. 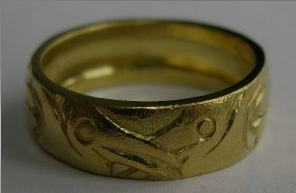 The detail is all the more amazing when you consider that the ring is cast, not engraved. 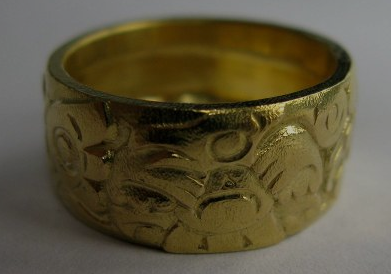 So far as I am concerned, Edenshaw produced a ring that is utterly unique, and wonderfully rich in humor and detail. 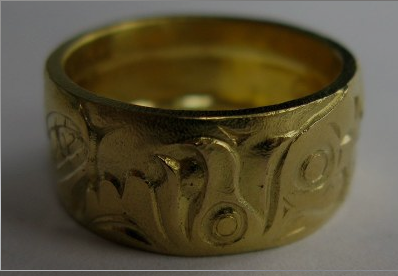 After wearing it for several weeks, and having appreciated the small extra touches with which it was delivered (in a small wooden box, with the promise that the mold would be kept, in case the original was lost), I fully intend to buy more of Gwaai Edenshaw’s work. But if, as I suspect, his prices rise as he receives the recognition he deserves, at least we have a couple of samples of his work to console ourselves. 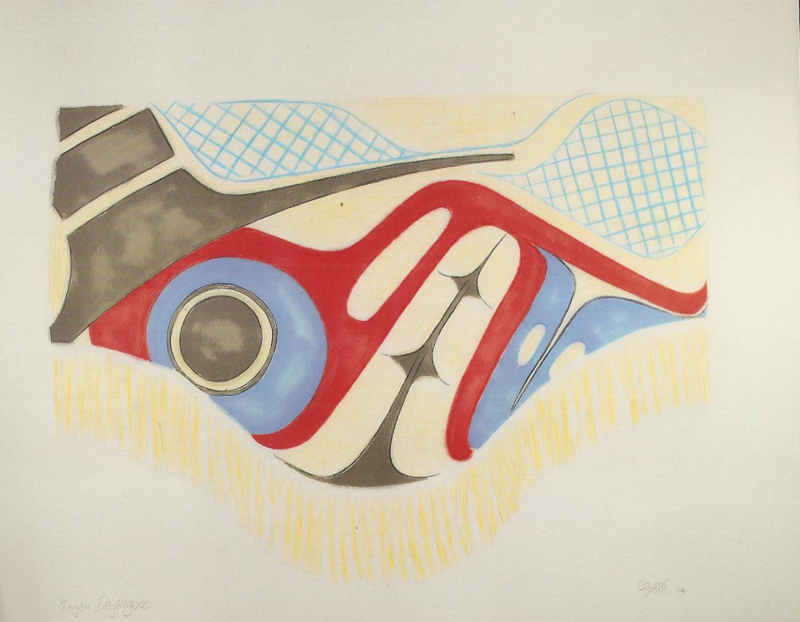 Haida art occupies a privileged place in Northwest Coast art. Because the revival of the art is associated closely with Bill Reid, who began with the Haida tradition, to many people, all Northwest Coast art is Haida, and Tsimshian, Nisga’a, Kwaguilth, Nu-chu-nualth, Salish and the others are not even names. Still, no one can deny that the Haida include many brilliant artists in every medium, so last night I went to the opening of Coastal People’s show, “Haida Masterworks” expecting to enjoy myself. Nor was I disappointed. In fact, the show exceeded my expectations. Since it had been only lightly advertised, I expected a small show. Instead, what I saw was a showcase of leading Haida artists, with works ranging from the classic to the contemporary. Several leading Haida artists featured prominently. Master carver Don Yeomans was represented by several circular panels and a mask well over a meter high –examples of what I think of as corporate art, since you need a large lobby, or at least an extremely long room with a high ceiling to display it in a setting that does it justice. Also prominently displayed was the better part of two years work by Reg Davidson, who is probably the leading carver of masks that can be used for dances and ceremonies. This emphasis gives his masks a simplicity of line and color that is rarely seen, as well as a unique dramatic quality. I am sure, for instance, that the large eye-sockets that characterize his masks increase their theatrical effect when seen in the firelight of a night-time ceremony. Yet another master artist who is well-represented is Isabel Rorick, a weaver who works largely with spruce roots and natural designs in traditional patterns collected from up and down the coast. I admit that I know little of basket weaving, and ordinarily think less of it. Yet even I could see that Rorick’s work was intricate and uniform. Despite the muted colors, the designs are clearly visible from ten meters away, and, up close, the evenness of her work make clear that she must spend hours upon hours in her craft. Among such works by well-known artists, I almost missed some wood-carvings by newer artists. However, on my second or third round of the gallery, I took time to appreciate some panels by Kyran Yeoman, Don Yeoman’s son, and a mask by Robin Rorick. Also on display was one of the first masks I’ve seen by goldsmith Jesse Brillon. However, small displays of works by Derek White, Rick Adkins, and Gerry Marks were more than compensation. I also took the time to appreciate the two-sided silver and argillite pendants by young artist Ernest Swanson. I had not given much attention to his work before the show, but I plan to correct that mistake in the future because of the fineness of detail in his engraving. But for me, the highlight of the show was the work in argillite by cousins Christian and Darrell White. Christian White, of course, is one of the most-skilled argillite carvers working today, and pieces like “Raven’s Children and “Eagle and Salmon” are typical of the strong lines and sense of restraint that I associate with his work. By contrast, Darrell White has only been working seven years to his cousin’s three or four decades, but he is rapidly perfecting his work. His style is less serene than Christian’s White, reminding me a little of Ron Telek’s, and having the same attention to detail. Pieces like “Thunderbird Captures Killerwhale” and “Raven Dancer” (below) show an originality of design that leave me looking forward to what he will do next. As usual at such events, appreciating the art was repeatedly sidetracked by the interesting conversations flowing around the gallery. Although I had only expected to stay an hour or so, I suddenly found that three hours had passed and I still hadn’t looked as closely as some works as I had wanted. But that just gives me an excuse to return, so I’m not complaining.